In celebration of The Senses: Design Beyond Vision, this Object of the Day post takes a multisensory approach to an object in Cooper Hewitt’s permanent collection. Fire destroyed the studio in 1893, and it was at his rebuilt studio that Ohr’s most representative pottery emerged. This pitcher is one example. Rather than emphasizing creativity and craftsmanship, many late nineteenth-century American ceramics were commercially produced in large quantities for profit. Factory workers adopted premixed, powdered clay and glaze and used molds to replicate forms. Ohr opposed mass production, claiming, “‘I am the apostle of individuality…I must be myself and I want every vase of mine to be itself. '” Believing in the doctrine of “no two alike,” he approached every piece as a unique form, and this pitcher explicitly reflects that view. The thin walls of unglazed earthenware resemble the texture of a brittle cookie, and the deeply ruffled lip and strongly twisted body illustrate traces of Ohr’s hands as he shaped the pitcher on the wheel. Journalist Wendy Moonan writes that Ohr “treated clay like pie dough, pinching it, crimping it, denting it, and manipulating the surface into angular folds.” The pitcher’s association with the motion of Ohr’s hands and body emphasizes that it is one of a kind. A slight change of Ohr’s gesture could result in a different form, so each object he made is subject to the actions of a particular moment. In comparison to typical mass-manufactured ceramics of his time, Ohr’s pottery was a radical departure. 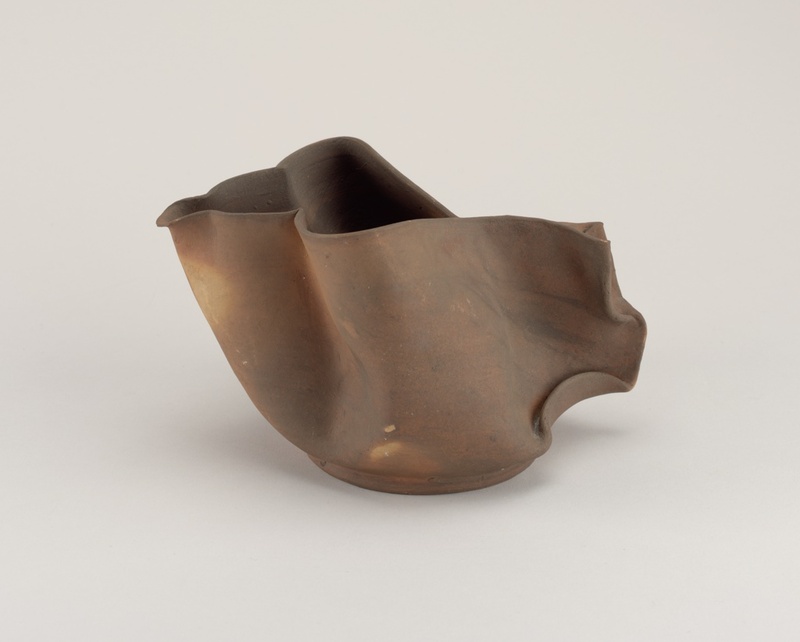 Asymmetrical and biomorphic, it was entirely different from traditional, graceful vessels made by Ohr’s popular contemporaries such as Adelaide Robineau, Susan Frackelton, or the Teco Pottery. By rejecting the functionality of traditional ceramic forms, Ohr’s approach was also extremely avant-garde. The capacity of this pitcher is very small, and its walls are so thin that they could easily break during use. Ohr’s ceramics might still appear unorthodox today, but they are at the same time embodiments of his singular design philosophy. Binglei Yan is a curatorial capstone fellow for The Senses: Design Beyond Vision. She is an MA candidate in the History of Design and Curatorial Studies program offered at Parsons The New School of Design jointly with Cooper Hewitt, Smithsonian Design Museum. John Stuart Gordon, “The Patron Saint: George E. Ohr and the Contemporary Art World,” in The Ceramic Presence in Modern Art: Selections from the Linda Leonard Schlenger Collection and the Yale University Art Gallery (New Haven, CT: Yale University Art Gallery, 2015), 89. Casey Lesser, “The Eccentric Mississippi Artist Who Pioneered American Ceramics,” Artsy, January 22, 2018, accessed March 26, 2018, https://www.artsy.net/article/artsy-editorial-eccentric-mississippi-artist-pioneered-american-ceramics. Garth Clark, “George E. Ohr,” The Magazine Antiques, March 2, 2015, accessed March 26, 2018, http://www.themagazineantiques.com/article/george-e-ohr/. Ellen J. Lippert, George Ohr: Sophisticate and Rube (Jackson, MS: University Press of Mississippi, 2013), 88. Wendy Moonan, “Recognition for Biloxi’s Mad Potter,” New York Times, July 20, 2001, accessed February 4, 2018, http://link.galegroup.com/apps/doc/A76696404/STND?u=smithsonian&sid=STND&xid=6ca2299a. ← And then There Was Light!